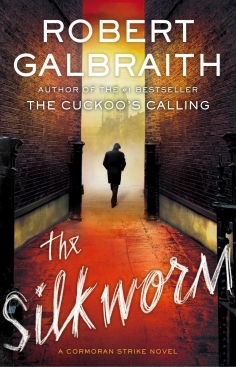 Robert Galbraith is JK Rowling: The secret is out! Last summer’s publication of the hugely enjoyable murder mystery The Cuckoo’s Calling by Robert Galbraith initially brought fine reviews, but only modest sales. However, there was one surprise whodunit connected to the book not even the publishers had expected. After a British newspaper revealed “former serviceman” Galbraith’s true identity was J.K. Rowling, author of the Harry Potter fantasy novels, sales of the book rocketed. Surprisingly, despite this revelation, Rowling has now used the pseudonym for the terrific sequel, The Silkworm, albeit with a note inside the cover. This satisfyingly long, 455-page murder mystery is part of a planned series of seven books featuring her psychologically damaged, incorruptible, one-legged detective hero, Cormoran Strike, and his secretary, Robin Ellacott, who dreams of being a sleuth. Rowling puts her knowledge of the often cut-throat world of publishing to good effect in this briskly paced, sometimes brutally observed story, which blends powerful emotions, real warmth, satisfying humour and gory violence with gripping suspense. Strike takes on the case of a poor, middle-aged woman, Leonora Quine, who is trying to find her missing, middle-aged husband, Owen. She thinks the philandering, less-than-successful, “so-bad-he’s-good” author has run off like before, and wants Strike to bring him home. Strike soon realises there is something sinister behind Owen’s disappearance. Owen had angrily vowed to publish his just-finished novel Bombyx Mori (Latin for “silkworm”) and his book, in the style of a Jacobean revenge tragedy, is full of grotesque and poisonous characters – thinly veiled portraits of people he knows. Many want him silenced. When the body of a murder victim is discovered, Strike faces a race against time to find the killer. Rowling was furious after she was outed, which happened after a lawyer working for her publishers revealed the secret to his wife, who told a friend, who tweeted the news. The huge success of her seven Potter books had made Rowling curious about whether she could survive as a writer without relying on her famous name. Her first post-Potter novel, The Casual Vacancy, published under her real name, is a densely plotted, often dark look at life in small-town England; it received rather mixed reviews. Happily, her absorbing, slow-burn Galbraith books show that she has rediscovered her magic touch. Rowling chose the pseudonym – “Robert” was the name of her hero, Robert F. Kennedy, and “Galbraith” a name she longed to have as a child – so she could write and receive “unvarnished feedback”. The pseudonym seems to have given her creativity free rein. The Silkworm is packed with powerfully evocative descriptions of people and places, alternately punchy, playful, then moving – yet always authentic – dialogue, and confident, cleverly constructed plotting. Rowling reveals little of Strike and Robin’s first case – catching the killer of supermodel Lula Landry, after police had ruled her death as suicide – so you can still enjoy that book after this one. Or, if you can wait, read them in sequence, to discover the wonderful world of Strike and Ellacott from the start. Much of the delight comes from immersing yourself in these likeable, credible, characters’ lives. Strike was a military policeman before he lost his leg in Afghanistan. He’s tough, world weary and overweight, nursing a broken heart and drawn to acts of kindness. Robin, Strike’s lively, beautiful, ever-resourceful secretary, is equally well drawn: she is torn between the love of her boyfriend, Matthew, and her determination to ignore his demand to find a better-paid job and work for the inspiring Strike. “I’ve been useful,” said Robin. Strike and Ellacott remain satisfyingly indomitable and fearless in this absorbing, often-moving story, which will keep readers guessing until the nail-biting end, and leave them hungry for more.